Mr. Calvin Pearson and Dr. Jarris Louis Taylor, Jr.
HAMPTON, Va. (February 1, 2019) – The Hampton University William R. Harvey Leadership Institute (WRHLI) held another Meet the Leaders Lecture Series, welcoming HU alumnus Calvin Pearson, founder of Project 1619 Inc.
“Mr. Pearson is an extraordinary leader and outstanding community member. 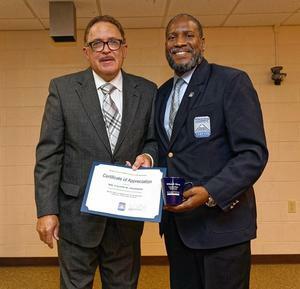 We are elated he could join us for the WRHLI Meet the Leaders Lecture Series, where he shared wonderful advice to our students about being a leader,” said Hampton University President, Dr. William R. Harvey. A lifelong resident of Hampton, Virginia, Mr. Pearson values the importance of history. He has worked as a community organizer for over 40 years with various organizations, such as The Boys and Girls Club. Mr. Pearson is the founder and CEO of Project 1619, a nonprofit organization, which raises funds to commission and erect a Memorial in 2019 in remembrance of the 400th anniversary of the Africans first landing in 1619. The Memorial will be placed at Fort Monroe near the original landing site, formerly known as Point Comfort. “I started this organization 25 years ago when I had the vision that the story of our ancestors was not being told correctly. In 2011, our message got to the White House and President Obama declared Fort Monroe a national monument because of the history we had uncovered,” Pearson said. The life journey of Mr. Pearson has not been an easy one. He lived through segregation, and was born into a family of overachievers where there were high expectations to succeed. Mr. Pearson stressed to the room of Hampton University students that if they did not like something, they could change it. “As a young child, I had to go see a white doctor and there was a white waiting room and a black waiting room. One day I was sick and tired so I walked into the white waiting room. Nobody made me leave so I stayed in the white waiting room. So when you have the opportunity to change some things, you just have to make that first step,” Pearson said. During his presentation, Mr. Pearson also spoke about leadership. “You don’t set out to be a leader. You set out to make a difference, because if you make a difference, you become a leader. Not because you are pledging that you’re a leader, because people will respect what you have done and then they’ll call you a leader. You have to prove your worth and if you’re worthy of it, then they’ll recognize you and your leadership skills,” Pearson said. “Mr. Pearson’s presentation was very thought provoking and his efforts with Project 1619 are very inspiring to me as an African American woman,” said Amber Smith, senior, journalism major. Mr. Pearson attended Hampton University and the University of the District of Columbia and has a degree in Engineering Technology. He has spent the majority of his professional career in Public Administration. 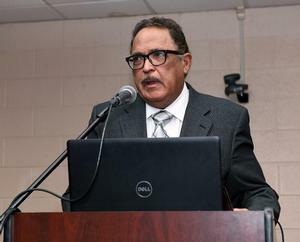 Being a lifelong resident of Hampton, Va., Mr. Pearson had a desire to research genealogy and the history of the first Africans in Colonial America.